With exciting new features and performance enhancements, you’ll learn how to accelerate from Go Karts to Grand Prix cars and Midgets to NASCAR. Race faster than ever in our improved racing game, played by 5 million people. 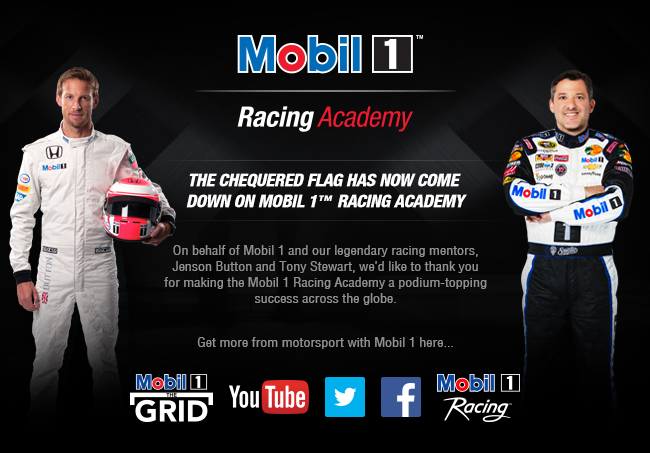 Enter the new Advanced Academy to fast-track to Grand Prix and NASCAR with tips from Jenson Button and Tony Stewart on how to make championship-winning maneuvers and understand from the drivers how the technology of Mobil 1 motor oil helps. Test your skills in all-new mini games and earn points to upgrade your engine and customize your cars. Learn how to make the perfect Grid Start, take the perfect racing line and overtake your opponents. To experience the Mobil 1 Racing Academy, which features 3D graphics, multiple car racing, and an amazing full-screen mode, you must have the Unity software plug-in on your computer.